The big news from the world of I am Dandy: The Return of the Elegant Gentleman is that Rose and I (and Rose's husband Kelly,) will be making a documentary this fall! We're very excited to revisit our dandy subjects and to have an opportunity to add some new voices to our menagerie of elegant fellows. I was also the subject of a mini-documentary called "Am I Dandy?" Excerpts from my article on The Thomas Crown Affair in the most recent issue of The Chap magazine. One of the most pleasant things about doing historical research is finding one's way down paths known only to locals. While taking a break from my research in London, I visited a friend of mine in Amsterdam for a week, expecting to find rather dandy-free diversions while there. The funny thing about obsessions is that they linger in the air around you, attracting their own kind. One night I ended up in an attic garret with a group of philosophy students from the local university, who were drinking wine, smoking hashish, and reciting poetry to one another. One young man, who was reciting some lines particularly violently, explained to me afterward that they were by Louis Couperus - a famous Dutch writer whose work is sadly overlooked outside his native country. Couperus was active during the belle époque, and was compared by many to Oscar Wilde, who was a fan of his. Several of his works are available in English translation at Gutenberg.org. But what I wanted to share are the beautiful book covers of some of his first editions, which are on Couperus' Wikipedia page. I hope my book looks this nice. 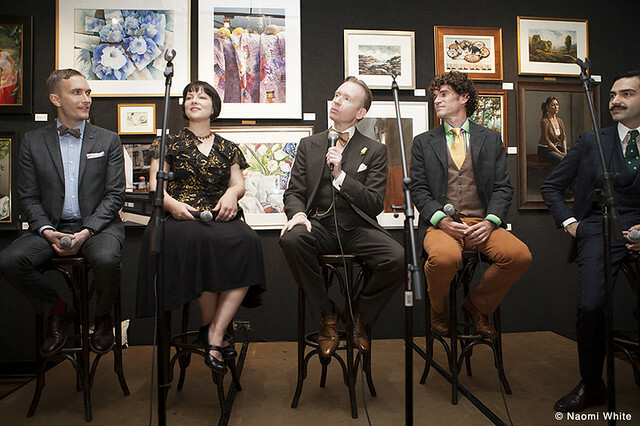 Last friday I took part in a panel discussion on Dandysim at the National Arts Club. The panel was moderated by Emmy Award-winning designer David Zyla, and featured Rose Callahan of The Dandy Portraits, Matt Fox of the Fine and Dandy Shop, and manners expert Thomas P. Farley. 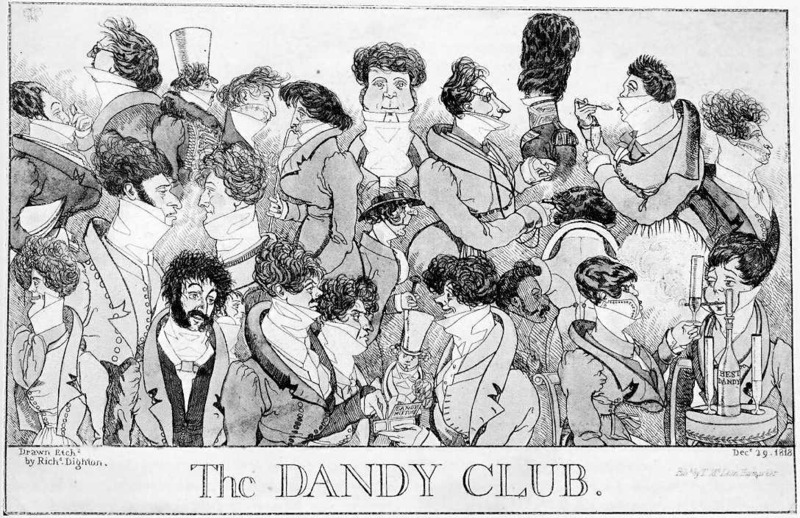 Rose has posted several photos on the Dandy Portraits blog. The event was the most popular installment so far of the friday fashion discussions which Mr. Zyla has been organizing - the Club was overbooked with RSVPs and a waiting list nearly as long as the guest list itself. The audience, as can be seen in the event photos posted on The Dandy Portraits blog, was incredibly stylish. Before the talk, Rose screened her excellent video about necktie designer extraordinaire Sean Crowley. The talk itself was only forty minutes long, and there were four panelists, so we each only got to speak a little bit, but the discussion was lively, and the questions from the audience were particularly good - questions about race, class, gender, and the relative importance of vintage/retro/nostalgia. After I shut down a question about the possibility of female dandies with the reply "no," my mother raised her hand to ask us to elaborate because she didn't want to let me off the hook that easily. After the talk, we were treated to fantastic jazz by Dandy Wellington and his band. 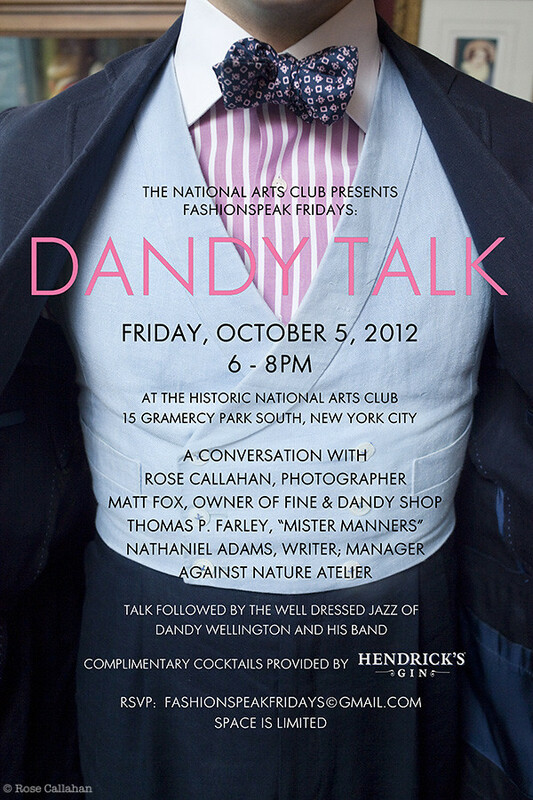 On Friday, October 5th, I will be participating in a panel discussion on Dandysim at the National Arts Club. With me on the panel will be Rose Callahan of The Dandy Portraits, Matt Fox of the Fine and Dandy Shop, and manners expert Thomas P. Farley. There will be a reception with refreshments provided by Hendricks Gin and music provided by Dandy Wellington and his band. I hope you can come! 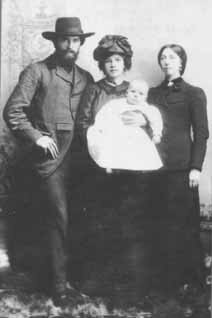 Mr. Oscar Wilde, much to the chagrin of his more thoroughgoing followers, still persists in wearing his hair cut short. Both in look and costume indeed he is so altered for the better that the name - prematurely given him by a satiric journal- of Oscar Tame would now fit him like a glove. One should note that Wilde, in great dandy style, was original and always ready to confound his critics by doing the unexpected - when his long hair became a cliche, he simply cut it off so that he couldn't be so easily caricatured as the languid, supra-bohemian aesthete. Below are a few pictures of the "Dandies" trading cards which Players Cigarettes printed in 1932. I bought a full set of these on ebay - they're not particularly rare or valuable in monetary terms, but it does say something about the dandy's persistent appeal that a company which usually made cards featuring sports figures for men with a twenty-a-day habit actually made this series.